vision days, in the process making this movie a sudden and surprising "must-see." will probably not have the same reaction, and those younger still may have none at all. 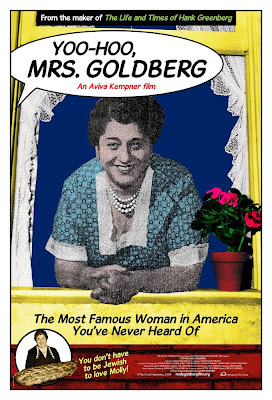 Yet Gertrude Berg, the subject of the engrossing, funny and charming documentary, YOO-HOO, MRS. GOLDBERG by Aviva Kempner, turns out to have a lot to teach us -- easily, entertainingly -- in this eye-opening film. 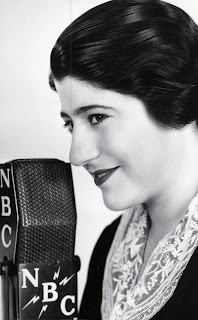 Mrs. Berg (shown at right, during her radio days) won the first-ever TV "Emmy" for Best Actress and, in a nationwide poll, came in second only to Eleanor Roosevelt as the most respected woman in America. (And she was Jewish, yet!) World War II, William Paley, the Blacklist, a withholding father, a loving husband and so much more make up the meat of the movie, most of which is fascinating stuff. The story of this woman, certainly nothing special on the outside, and how she pursued her ideas and dreams to fruition, is not simply inspiring but a little shocking, too. How she was able to make such enormous contributions to show business, Jewry and America as the world's great melting pot makes a terrific story, and Kempner tells it, if not terrifically, certainly well enough to hook us and hold us. Ms. Kempner, pictured above, also gave us The Life and Times of Hank Greenberg a few years back and was the producer and researcher for the ground-breaking 1986 documentary, Partisans of Vilna. 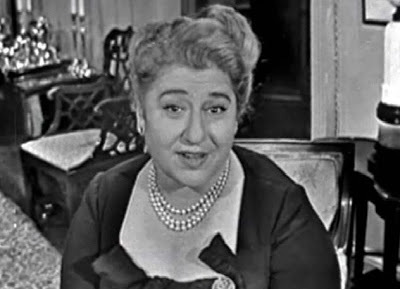 Watching her consideration of the life and times of Mrs. Berg makes it clear how ripe and ready Gertrude and her "Molly" counterpart are for rediscovery -- and how odd and crazy it is that the two of them have almost disappeared from our national consciousness. Berg's radio and TV series, The Goldbergs, was the most popular show of its time. When it finally went off the air, its prime time-spot was taken over by Lucille Ball and her I Love Lucy, which itself went on to become America's most popular TV show. Yoo-hoo, Mrs. Goldberg raises so many interesting points along the way -- about anti-Semitism in the U.S., the Holocaust, a woman's place, and how a fantasy family can replace the real one -- that you'll find something sweet, sad and/or thought-provoking around almost every corner. 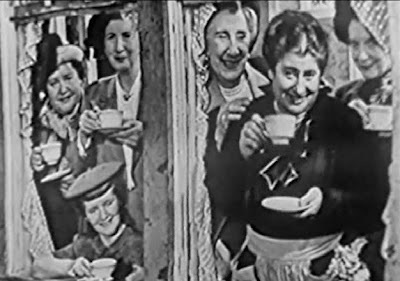 Berg was also, it turns out, the originator of the "star" hawking a brand (as she's doing above, with her little TV ladies' group, telling us how delicious Sanka coffee can be). 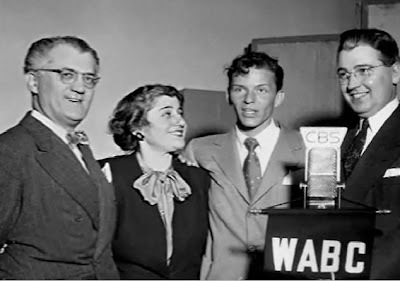 Below, she stares enrapt at a very young Frank Sinatra. Further below you can see her, dressed to the nines, appearing on Ed Murrow's TV show. This lady sure got around. You'll get around with her if you take in Ms. Kempner's film, which International Film Circuit is releasing to theaters beginning Friday, July 10. It opens first in New York City at the Lincoln Square and the Quad cinemas. A further limited national roll-out is expected. TrustMovies: How come Akiva Goldsman is a man and Aviva Kempner is a woman? Is it the difference between the K and the V -- as in Francis and Frances? Or are Israeli/Hebrew names used for both sexes -- as in Ronnie and Sandy? 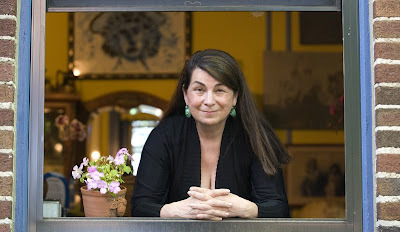 Aviva Kempner: Aviva means Spring in Hebrew -- and I tried all day to find out what Akiva means. He is a very talented writer. Are any of the old Goldberg shows available on DVD? If not, how might this come to pass? The shows were never syndicated and also maybe she was too early for them to be known. And you know from the film that the blacklist hurt her. The good news is that UCLA is putting the shows together sometime in the future in DVD format. That is great news! 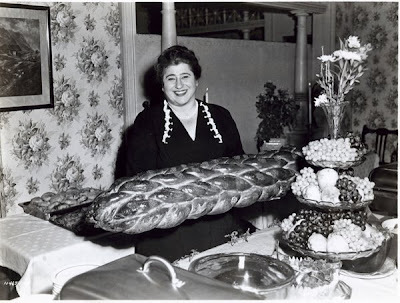 What happened to Gertrude Berg's husband, who was so supportive of her (as opposed to her father)? He outlived her, staying in the apartment in New York, and they are buried next to one another. The history that your film covers -- pre WWII and radio (William Paley's help during radio and hindrance w/TV? Odd...), then the war, and post-war, and television; the Blacklist and Philip Loeb; Broadway and a Minority of One – is so thorough and inclusive. But what, specifically, did Gertrude die of? She had a bad heart and high blood pressure. Have you sold the doc to TV yet? Greenberg went there, right? To PBS? No television deal as yet. Right now I am just concerned with my theatrical release. I make my films to be shown on the big screen in movie theaters. What's next on your plate? Maybe a film on the Rosenwald Schools or Samuel Gompers.